There are several options to consider before purchasing king size bedding. Your choices include budget-friendly, casual, and elegant options. You may prefer a bedspread over a comforter, duvet or quilt. Designer bedding is typically more expensive and represents an investment that will last for years. Things to consider when purchasing bedding is quality in the construction, fabric, style and colors. Read description details carefully so you know exactly what you're getting. 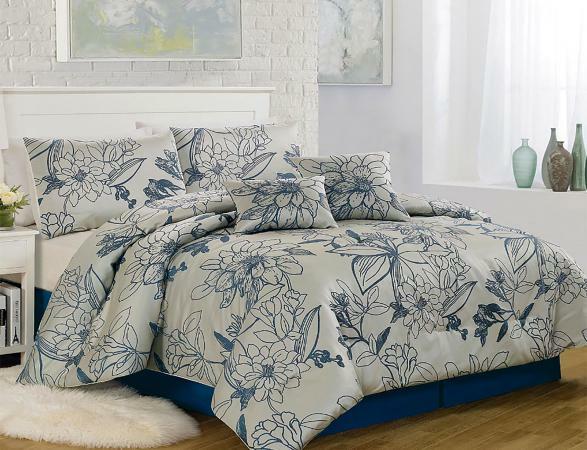 If you're looking for a stunning comforter set that is gray with blue flowers, this is it. Wayfair helps you style with this Textiles Plus, Inc. Summerline 6 Piece Comforter Set that is fashionable and energetic. This blue and gray floral comforter set has received excellent customer reviews. Wayfair customers are very pleased with the look and the great savings. One customer commented that the background looked white on her computer screen but was actually gray. Another commented that the comforter is dry clean only; however, the website states that it's washable and no other customers mentioned the comforter being dry clean only. In fact, one customer purchased the set for her daughter's first year in college and reported that her daughter loved it. Give your bedroom a touch of nostalgic elegance. 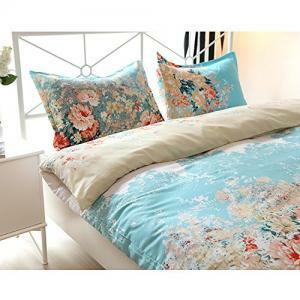 Vaulia offers a great budget-friendly lightweight duvet cover set in an appealing vintage floral design. If your color scheme includes teal, this can be a great addition while introducing various pinks and beiges splashed throughout this watercolor flower pattern. 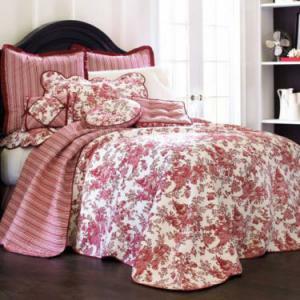 The floral bouquet is wide and flows across the lower portion of the duvet cover. The duvet features a hidden zipper closure that creates a smooth and even look once you've inserted a duvet or comforter. Amazon customers like that the duvet cover is lightweight and the product they received was like the one pictured on the website. Several customers commented that the colors were vibrant and pretty. They also like the hidden zipper closure that makes inserting and removing the duvet or comforter "ridiculously easy," according to one comment. Customers also love how soft the fabric is with one comment stating it is "luxuriously soft." Fabric is 50% cotton/50% polyester microfiber. Place your old comforter or duvet inside this duvet cover and snuggle up. Machine washable, tumble dry. Do not dry clean. 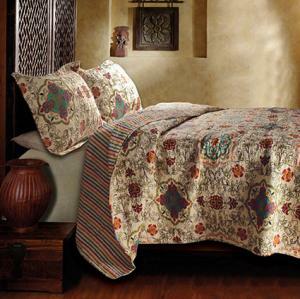 Greenland Home Esprit Spice Quilt Set is Amazon's Number 3 bestseller in bedding. It's clear that exotic and whimsical is a top Amazon seller when it comes to bedding. The quilt design was inspired by modern art featuring motifs that "provides a perfect accent to a bohemian lifestyle." The multi-colored quilt is also oversized allowing it to cover deep pocket mattresses. The design is versatile and can be used in a wide range of interior décors and themes. The flowers and mosaic motifs grace one side in an Art Deco pattern with a coordinating stripe on the other side. Customers commented on the quilt being lightweight and perfect for their needs. Several noted that the quilt colors are brighter and lighter than shown in the photo, but the majority were still content. Some of the other aspects that customers loved include texture, colors, and pattern. Nothing says Southern comfort better than the official Colonial Williamsburg Garden Images Parchment Bedding floral comforter set. This Colonial Williamsburg bedding ensemble features a gorgeous white magnolia blossoms and dogwoods blossoms pattern over a soft cream damask background. Colors include golden yellow, chocolate, light tan, white, natural and celadon. The gathered bed skirt and Euro pillow shams are a matching stripe. The set is 100% cotton. This is a new version of a time-valued favorite that was inspired by magnificent magnolia trees and abundant dogwood trees growing within the Williamsburg historic area. It is a lovely historic alternative for anyone tired of modern floral designs. The comforter is oversized to ensure it will cover deep pocket mattresses up to 15". If you aren't sure about the colors, you can order a swatch sample to view in your bedroom to see if it will match. 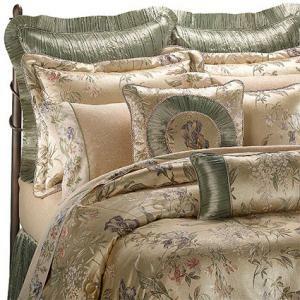 Toile Garden Bedspread and matching accessories from JCPenney add a touch of French aristocracy to your bedroom décor. This stunning toile pattern is made from cotton with cotton fill. Decorative pillows in round, square and oblong shapes. The bedspread features a scalloped edging with a contrasting color binding trim that's not commonly found in toile bedspreads. JCPenney customers commented that the bedspread was a high quality product. Several remarked that they chose a bedspread over a duvet or comforter since it is lighter weight and less cumbersome. One customer owned the bedspread for over a year and commented how easy it was to wash and care for and in fact, she purchased a second one to have on hand. Other customers enjoy that the striped backing makes the bedspread reversible. Sleep in a field of pink and white flowers with this truly striking 100% cotton four-piece Little Pink Flower Duvet set. This unique fabric pattern is the result of 3D photograph printing, giving the fabric a dimensional appeal. This is a 3-D printed pattern of a hillside lavender field. The pillow shams make you feel as though you're lying in a bed of brilliantly blooming lavender flowers. The fabric is the result of reactive printing, a dye printing method that uses various mixes to create colors. The images are bonded to the fabric using a "heat-activate printing additive." This allows images to be permanently bonded to fabrics. Bed Bath & Beyond displays elegance with the Croscill® Comforter Set In Iris. The floral bedding is rich in texture and satin background. With bouquets of apricot and lavender colored flowers on a backdrop of crinkled satin, you're sure to fall in love as much as the customer did with this comforter set. The comforter is polyester faced with a cotton backing and polyester filler. Gold and white vines are accentuated with crinkled satin. Corded trim finished the gorgeous bedding set. Bed Bath & Beyond customers love their purchases and commented on the high-quality and elegance of the satin fabric and pattern. This four-piece Croscill Classics® Diana comforter set is striking in blue floral against a white background with hints of ivory. Sold by Amazon, this classic look of a damask jacquard will transform any bedroom into a magical elegance. One of the most outstanding feature of this set is the attention to detail. The comforter and shams are trimmed with an ivory cord trim and flanges made from darker blue matelasse fabric. The luxurious look doesn't stop there. The pleated bed skirt is fashioned from blue linen with soutache trimming (used to hide seams). The finishing touches elevate this set to a high-end luxury choice. Lavish Home presents an incredible buy with the Amanda 25-PC Room-In-A-Bag. This incredible set includes everything you need to set-up a great looking bedroom, including curtains. If a lavender and white floral design is your ideal bedroom decor, look no further. The most outstanding feature of this set is the sheer number of pieces included. It's very rare to find such a complete set-up for a bedroom. This set even includes window panels, valances and tie backs. The economic advantage of this purchase is considerably less than purchasing the pieces individually. This set will give your bedroom a boutique look. The fabric is 100% polyester. All pieces coordinate nicely for an ensemble that would cost several times more if purchasing individually. Wash cold water, tumble dry low heat or dry clean to clean. The best way to shop for bedding is to browse websites and stores until you find a pattern you like. Once you set your heart on a specific floral design, shop around to get the best price. Visit bedding outlet stores, discount websites, and search for sales to get the best bargain possible. Saving money on a great bedding ensemble means more money to accessorize a new bedroom look.